I always believed a mastodon was just a single species of extinct proboscideans but it is actually up to four different species that together make up the genus Mamut within the family Mammutidae. The most famous of the genus Mamut is the American mastodon, (Mamut americanum) which only went extinct 11,000 years ago. This be-tusked beast had a huge continent-wide range stretching from New England in the north to southern California in the south. 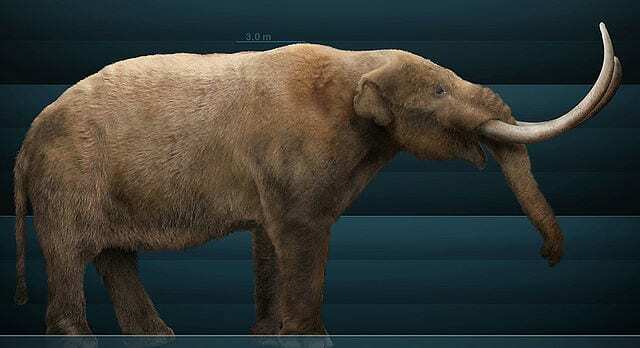 It had a thick shaggy coat of hair and with tusks over 5m in length and favoured browsing in coniferous forests. The first remains discovered of the mastodon was a single tooth found on the banks of the Hudson River in New York state in the summer of 1705 by a Dutch farmer. This tooth was promptly sent to London as the tooth of an undiscovered giant monster giving it the name of American incognitum. Later in the 18th Century more discoveries of mastodon remains included bones, teeth and tusks from a locality in Kentucky and were also sent over to Europe. The proximity of the conflicting set of remains, one very much like modern day elephants and these unusual shaped teeth, led anatomists, such as John Hunter (of the Hunterian Museum fame), to declare that the remains were from two animals, one like the elephant and another from a new undiscovered giant flesh eating animal. As more and more of the remains of mastodon were discovered a mild panic spread across the new American republic of a giant carnivorous beast roaming the interior of the continent. It wasn’t until the philosopher Benjamin Franklin proposed, possibly to quell this hysteria that the mastodon’s distinctive tooth shape might have been ‘as useful to grind the small branches of trees, as to chaw flesh‘. One of the distictive features of the mastadon are its teeth. The original classification of all species of mastodon was given to them by the big boss of nomenclature, the great, the revered, the HUGE (he got seriously obese towards the end of his life, the joys of good French living), the brilliant French naturalist Georges Cuvier in 1806. He gave species the genus Mastodon, (which has since been superseded by Mamut). The name was chosen on the distinctive shape of the molars you can see in the photo, the dirty minded Georges seemed to believe the cone shaped cusps of the teeth resembled breasts (me, I personally can’t see it) so assigned them the name Mastodon which was derived from Greek Mastos (breast) and odont (tooth). Filth. Alongside the remains of megafauna that were being dug up under the streets of Paris around the same time as the American mastodons, the mastodon specimens are some of the most important specimens in the history of science. At the time of these discoveries the accepted wisdom prevailed that every creature was divinely created at the beginning of the world and had a perpetual role to play in nature. However, due to the sheer size of these animals the aforementioned Cuvier began to conclude that there couldn’t possibly exist on the Earth these huge animals undiscovered by man, they were simply too big. He concluded that periodically the world underwent abrupt changes that led to species being wiped out, and used the word extinction to describe this. Without the idea and concept of extinction, you most certainly have not get evolutionary thinking that was to following the 19th Century. Trunk, check, hairy, check, tusks, check. Mammoths and mastodons are the same, right? Nope. Mammoths, belonging to the family Elephantidae, (which includes modern day elephants) and the mastodon family Mammutidae diverged some 27 million years ago, which makes them distant relatives, with mammoths far more closely related to elephants that their hairy mastodon contemporaries. The biggest difference is diet as suggested by the fossil remains of their teeth. Mastodons with their booby-like molars crush leaves, twigs and branches whilst mammoths with thier flat ridged molars graze like Asian elephants. Still incredible and structure is so fitting for a browser rather than a grazer. 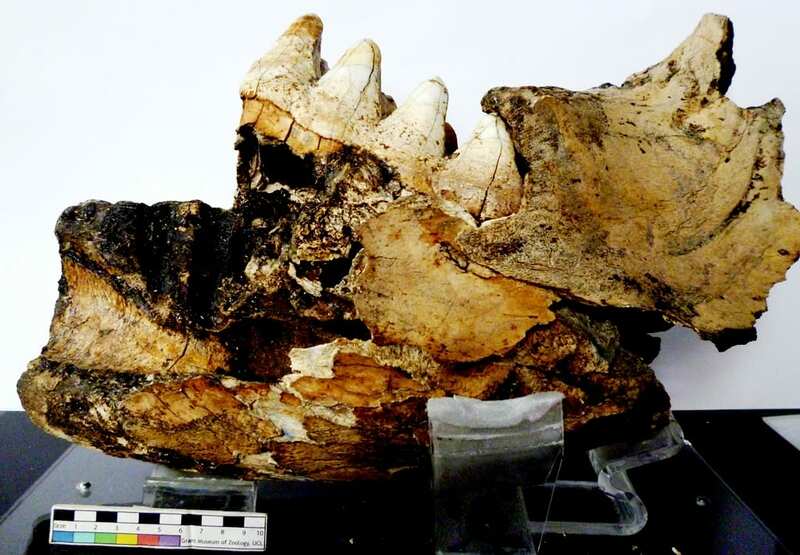 I read a couple of recent articles about Mastodon jaw fragments found in Temecula in southwestern Riverside County and a giant one found by a diver. These animals were fascinating! Do you know how long they lived?